"A safe retreat against intrusion or invasion"
"A large fortified building or set of buildings"
The history of the castle therefore can date back to the time when people started to live in settled communities - the Stone Age! The Causewayed Camps fall into the castle definition of "A safe retreat against intrusion or invasion. How do Causewayed Camps, or Enclosures relate to the History of the castle? What was the purpose of Causewayed Camps? What did Causewayed Camps look like? When looking at the History of the English castle we need to look for people who worked together to create, or build, a safe retreat against intrusion or invasion! This applies to people living in England during the Neolithic Period, the Stone Age. What was the purpose of Causewayed Camps, or Enclosures? A Neolithic Causewayed Camp was built as an enclosed area which was used for a meeting place for formal tribal purposes, trading, animal compounds and defence from intruders. A safe retreat against intrusion or invasion from other Neolithic, or Stone Age, tribes or even just to keep wild animals out! They were not necessarily used as sites which were always permanently occupied by people. Neolithic Causewayed Camps were generally built on hilltops and consisted of a central ritual area which was surrounded by several concentric, or spiral, rings of banks and ditches. The means of crossing the ditches, or defences, were by several causeways ( raised roadways ) hence the name of 'Causewayed Camps'! It is believed that the ditches were excavated in sections, leaving the wide causeways intact in between the ditches. The Neolithic Causewayed Camps were quite large, covering an area of around 3 acres. What was a Causewayed Ditch Ring? Archaeological evidence and examples of famous English Neolithic Causewayed Camps include those at Hambledon Hill, Windmill Hill, Crickley Hill and Coombe Hill. 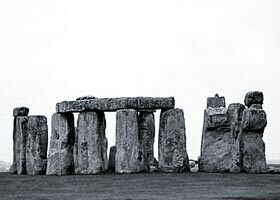 The sites are some of the oldest remains in the English landscape. Why were Causewayed Camps so important to English castle history? Causewayed Camps are extremely important to English castle history and evolution. They mark the transition from a Nomadic society where the people were Hunter-gathers, who constantly moved from one area to another, to a community of people who became settled in just one area. The facts and information provided on this page are highly relevant to anyone with an interest in English castles!